The name is puzzling. Why should a 19th century naturalist in Pennsylvania get a turtle named after him? 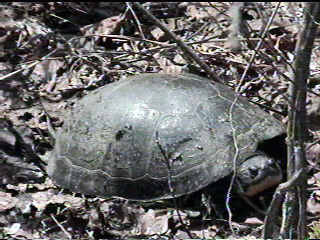 I imagine naturalists in that era were active chaps and this turtle is even slow for a turtle, and decidedly not venturesome. 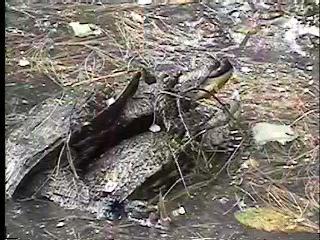 I prefer calling it a Basking Turtle. 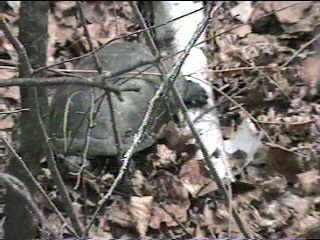 As with most turtles, I usually see it in the spring basking in the sun, and twice I've stretched out and basked with one right next to me for more than 30 minutes. 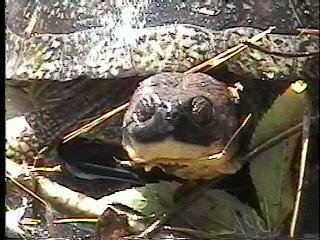 The Blanding's Turtle is much bigger than a painted turtle and box turtle and not quite as big as a smallish snapping turtle. 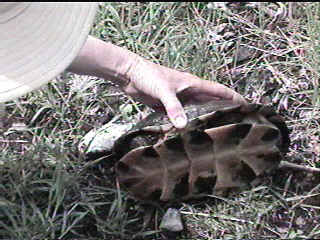 The ones I see are generally in a shell about nine inches long, and that shell forms a nice smooth dome, which distinguishes it from the snapping turtle whose shell looks more streamlined, like a weapon of modern war. Another distinguishing feature is its bright yellow throat. 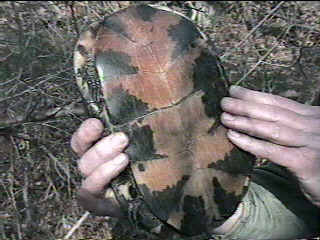 Like the painted turtle, it often seems to pose with its neck stretched out, but the painted turtle's neck has stripes. 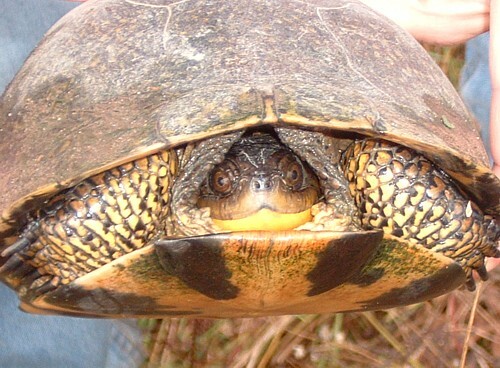 The Blanding's Turtle's neck is thick, but, strangely, never menacing. 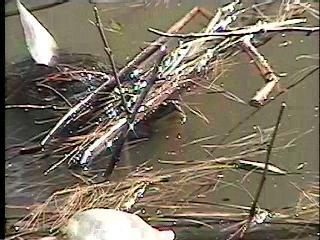 and on logs rotting in the pond. 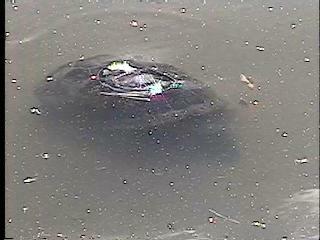 (The smaller turtle is a painted turtle, which soon slipped into the water as I approached. 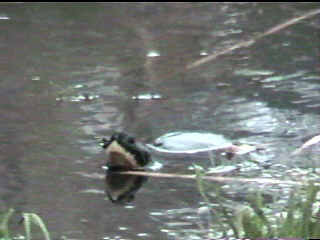 The Blanding's turtle wasn't bothered by me at all.) 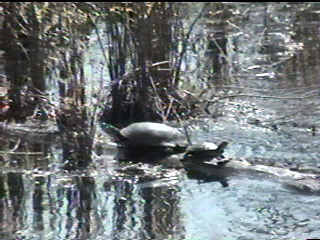 And, unfortunately, I've seen them crossing country roads and had to stop my car and carry a turtle across the road. My strangest encounter was on a warm sunny October day, as I approached a small pond or our land. 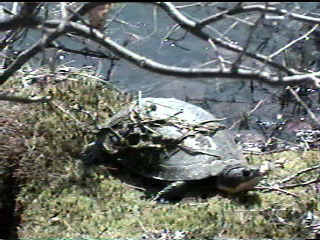 I saw a Blanding's turtle seemingly floating in the water, that is, its shell was not fully submerged in the water which I knew was about a foot deep. And she also saw me. She reacted, sinking in the pond, turning and disappearing in the water with her happy go lucky mate going along for the ride. 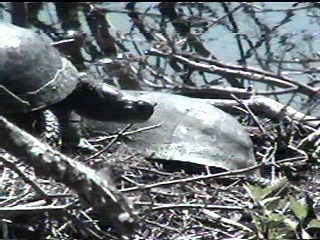 The strange thing about Blanding's Turtles is that the only turtles I find are already full grown. 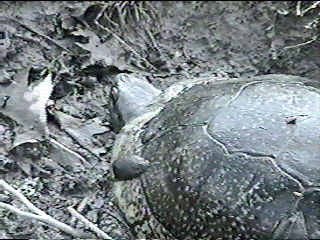 Obviously the turtle mates, lays eggs, and some of them must hatch and there must be little turtles somewhere, but I've never seen any, and other naturalists don't seem to brag about finding them. 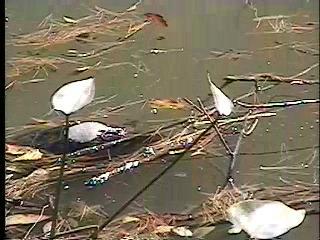 Since I've usually found the turtles basking in the sun or walking between ponds, I can't say from first hand experience what they eat. Judging from what else I've found in the small bog where I've found the turtles, I expect that they can survive on the small things found in, on and around small ponds. That said, they obviously don't devour everything because in that little bog where they have been living at least four years, the wood frogs return every year. And come to think of it, I often see leeches, another likely thing for them to eat, hitching a ride on the turtle's shell.